James Kennedy » Whatever happened to you, Jinx girl? Whatever happened to you, Jinx girl? Here’s some more art inspired by The Order of Odd-Fish — possibly the very first piece. It was painted by a woman I used to see all the time. Her name was Michelle, and she worked at Jinx, the now-defunct coffeehouse where, along with Letizia’s, I wrote most of Odd-Fish. I have no idea what happened to Michelle. I don’t even remember her last name. She was hilarious, though. We had planned for her to illustrate the whole book. 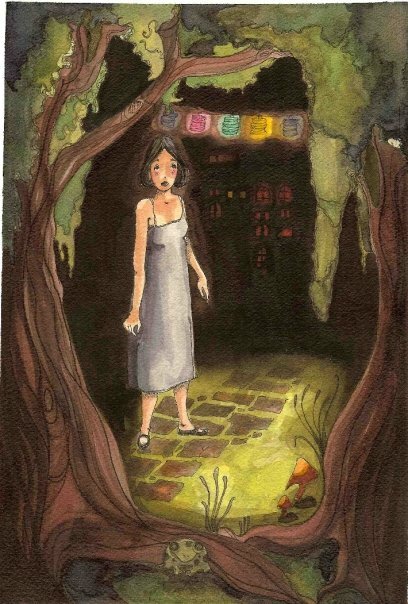 This was her picture for the first chapter: Jo creeping around the ruby palace’s garden during Aunt Lily’s costume party. I particularly like the mysterious red windows simmering in the background darkness, the way Jo is curvily framed by trees and Chinese lanterns, and the merry toad crouched among the roots. It’s a weird coincidence that Michelle’s choices of colors and composition are startlingly close to what became the actual cover! Michelle told me the strangest stories. Looking back, I wonder if she was pulling my leg. She claimed to have grown up in a haunted house. She said that as a child, when she was walking down her hall, a mysterious force would sometimes suddenly throw her to the floor. Or that once, when she and her brother were listening to Madonna’s “Into the Groove” on the radio in their garage, the song suddenly stopped and a scary voice shrieked out of the radio, “GET OUT. NOW.” Or how her psychic friend, who hadn’t been told Michelle’s house was “haunted,” once came over but immediately ran out the front door because she saw invisible gooey demons crouching in the corners of all the rooms. Michelle also spun ludicrous yarns about the adventures of her high-spirited, eccentric muu-muu wearing grandmother in Hawaii. Michelle, Michelle, where are you now? There’s been some nice reviews of Odd-Fish popping up lately (Green Man Review, Charlotte’s Library, Granite School District), and I was particularly gratified to see that the Smithsonian chose it for one of their Notable Books for Children 2008 list. What else is going on? Well, I’ve entered a public chess match with Brian Costello (of the Featherproof Press novel The Enchanters of Sprawlburg Springs). Every night we’re to text each other our next move. I’m a terrible chess player, though, and Brian practices against his computer, so I fully expect to get creamed. For those of you in Chicago, I’m going to be reading for Local Author Night at the Book Cellar next Wednesday, January 21. Other writers to appear: Laura Benedict (Calling Mr. Lonely Hearts), Bryan W. Alaspa (Rig), and Joe Kilgore (The Blunder). If you’re in the Detroit area, on January 23 I’m doing a reading and signing at the Rochester Hills Borders, and on January 24 I’m doing an event at the Rochester Hills Public Library (see sidebar for details). I’m also going to speak at my old high school, Bishop Foley, which should be appropriately nerve-wracking. Humiliating fact: I had so many detentions at the end of my senior year that I was forced to keep going to detention even after graduation. Humiliating, because . . . why did I continue to go? What could they have possibly done to me at that point?